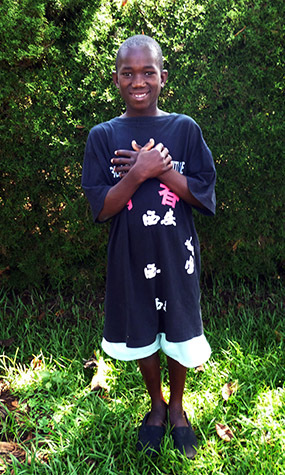 Lawrence Ssebunya is a humble child with an infectious smile. He originally dropped out of school in Primary 5 because his mother couldn’t afford his school fees after his father left the family, but thanks to support from the Cosma Foundation, he recently sat for his Primary 7 exit exams and did very well. Out of six children in the family, Lawrence is the first born, and he enjoys playing with his siblings and helping them with chores like washing dishes, fetching water, and cooking food. At school, he likes playing football, reading novels, and interacting with his friends. His best subjects are science and English, and he would like to become a teacher. One of the biggest obstacles Lawrence faces is that it takes him two hours to walk to school, and when he gets back home he has to help with chores, making it hard to find time to study. However, he’s very grateful for the opportunity to attend school, and he continues to excel against all odds.